New Costco coupons time! 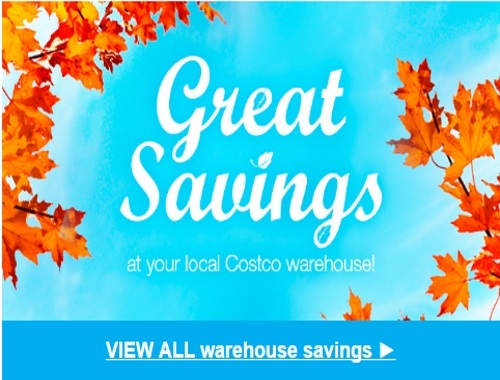 Here are the latest coupons for Costco Warehouses in West Canada, this includes BC, AB, SK and MB. Please note, you do not have to print these coupons, they are available when you enter any Costco store in Canada, we just post them so that you can pre-plan your shopping trips! $3 OFF Buffalo Ladies’ socks. pack of 6. 485539. Price before discount: $9.99. $35 OFF the purchase of 4 boxes of Air Optix Aqua Sphere (6 pack), Air Optix Multifocal, Air Optix Astigmatism, Air Optix Night & Day, and Dailies AquaComfort Plus Sphere, Multifocal and Toric contact lenses (90 pack). $10 OFF Poise Ultimate absorbency. pack of 144. 323795. Price before discount: $49.99. $6 OFF Webber Naturals Triple-strength omega-3. 900 mg. 180 enteric softgels. 596192. Price before discount: $26.99. $6 OFF L’Oréal Revitalift Day or night face cream. 100 mL. 349696, 349697. Price before discount: $28.99.
. $5 OFF 3M Scotch tape refill. pack of 8. 81843. Price before discount: $17.99. $3 OFF Softsoap Soothing aloe vera hand soap. 2 x 2.36 L. 366500. Price before discount: $11.69. $3.50 OFF 3M Scotch tape. pack of 6. 1675749. Price before discount: $12.49. $2.20 OFF Colgate Total Toothpaste. 5 x 170 mL. 984058. Price before discount: $9.99. $70 OFF the purchase of any set of 4 Michelin tires. Discount only available on purchases of 4 tires. ALSO ON COSTCO.CA. $12 OFF HappyLight Liberty Energy lamp. VT15C. 412221. Price before discount: $59.99. $50 OFF the purchase of any set of 4 BF Goodrich tires. Discount only available on purchases of 4 tires. ALSO ON COSTCO.CA. Click here to view the coupons. Thanks for this posting. Makes it a bit easier planning my Costo shop.